Bermuda has made a “compelling case” to host the America’s Cup according to Russell Coutts. Coutts, the director of the America’s Cup Event Authority, said in a press release that Bermuda and San Diego are the final two places to be the host for the 2017 America’s Cup. Bermuda and San Diego have been shortlisted as potential host cities for the 35th America’s Cup. Chicago, which had also been under consideration, is now a likely venue for America’s Cup World Series racing in 2015 and 2016. To advance the venue selection process over the coming months, the America’s Cup Event Authority will work closely with both venues to finalize logistics requirements and commercial opportunities, as well as to establish the needed relationships with private and public entities to ensure a successful event. The host city for the next America’s Cup will be announced by before the end of this year. Bermuda, having made it to this final stage of the bidding process, will host the America’s Cup World Series no matter the outcome of the final venue selection, which will mean an influx of people to Bermuda’s shores for possible events in 2015 and/or 2016. Premier Michael Dunkley said if Bermuda is successful, the benefits from hosting the 2017 event in terms of job creation and boosting the economy could be “unprecedented”. And he stressed the fact that hosting the event will require a unified, community effort from everyone in Bermuda. 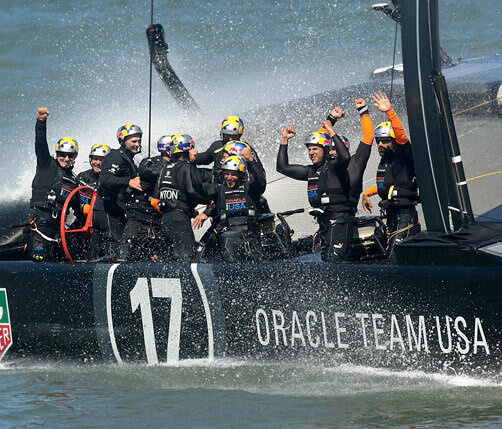 In 2013, San Francisco saw an estimated $346 million for hosting team Oracle’s successful defence of the Cup. That would be equal to 30 Newport Bermuda races. And Dr Grant Gibbons, Minister for Economic Development, told the Bermuda Sun in June that the event in san Francisco had created 2,000 jobs for that city and our island could expect a similar impact if were selected as the host. Premier Dunkley said, “The America’s Cup is the oldest trophy in international sport, predating the modern Olympic Games by 45 years. The event was last hosted by San Francisco in September 2013 and was won by the Oracle Team USA. The finals included a series of races over a period of three months. “If Bermuda is ultimately successful it has the opportunity of being a milestone, spectacular event for our Island. It will highlight Bermuda’s legacy as a maritime, sailing destination and give us unprecedented international exposure. “Hosting an event of this magnitude on Bermuda’s shores will require the support and participation from all spheres of our community. It will require a unified effort from everyone. The benefit potential for Bermuda is something that we should all be cognizant of, and I very much look forward to joining with all of Bermuda in showcasing our hospitality to the world. Meanwhile from an economic development standpoint, Minister Gibbons said that hosting the America’s Cup would accelerate development and investment in several industry areas on the Island. Minister Gibbons said: “I can only echo the Premier’s comments in saying that we are very focused on our bid and on generating commercial sponsorship in support of the bid. We are extremely enthusiastic about the possibility of having the privilege of hosting the America’s Cup Finals in 2017. This would be an historic moment for Bermuda, if chosen, and we look forward to continuing to progress through the bid process.